I have seen the future. There’s not much petrol in it. After a year of rancour, the Central Bank of Nigeria (CBN) finally gave in and abandoned the unrealistic peg at N197 to $1 that it had maintained was suitable and necessary. The whole of social media was ablaze with commentary. When I read through the (pretty robust) memo detailing the changes, I was impressed. No halfway house here. A full float of the currency and the introduction of naira settled non-deliverable futures (NSNDF) to curb speculation**. It was a little too good to be true. They seem to have covered everything. For a good coverage, check out Feyi Fawehinmi’s post – The Price Club: The New Nigerian Naira. Some think it will boost humanity to heights previously unimagined. Others believe it will be our undoing. Either way, we can all agree it will change the way the world works even if we can’t even begin to describe the specifics of how those changes will look. One thing that does come up a lot is how it will change the world of work and that’s something we should take seriously because of the potential for wide scale social disruptions. I read an interesting article a couple of days ago from where I’ve linked the chart above. That chart describes work, split into four broad parts based on whether it requires manual labor or mental labor as well as whether it’s routine or non routine. As you can see, employment from anything routine has sort of flat lined over the years. This is because conventional machines run on code, a set of instructions on how to process inputs and provide some sort of outputs. So if you can codify the work, it’s probably been or is being replaced by robots and/or computers. Even China, once renowned for cheap labor fueled manufacturing is rapidly automating. News blobs like the one from this article repeated below, are only going to get more common. Midea, a major appliance maker, is in the forefront of a full-blown charge by China’s manufacturing sector into robot-powered factory automation. Companies nationwide over the past five years have ramped up robotics in the face of labor woes, such as worker shortages and rising wages, and to cut their production costs. In the process, they’ve helped build a new market for Chinese robot manufacturers that are competing against multinational rivals. So it seems like the last bastions of work are the non-routine manual works – think artisans, crafts work, etc. and non-routine cognitive tasks. While the former is generally not well paid, the cake as it were is in the latter, and we’ve tended to believe that we’ll always trump computers/robots in that regards. Until now. For some years a new paradigm, machine learning, has been changing the game for artificial intelligence and it’s accelerating. One key example was the recent trouncing of a human being by AlphaGo, a computer, in the game of G0, which is so mathematically complicated that you have to play it not by brute force by some sort of feeling or heuristic, which is how humans proceed. Today it’s a game, tomorrow it’s probably your job. Such is the nature of progress. And that type of progress brings with it a lot of questions. What would we do given that we earn our living from working? If a robot can do it better without complaints, demands for a minimum wage, all day and everyday, will humans be able to compete? Perhaps in a future version of a mental sweat shop where cognitive power is exchanged for the lowest possible price? Dear Lord! Dreadful thoughts. And what about inequality? How will that play out? It’s easy to see that he who controls the technology is set up for life. And beyond. We can fully expect inequality to get even worse. And all those developing countries dreaming of a future manufacturing boom to provide employment (cough, Nigeria)? So the future looks like a place of mass unemployment and burgeoning inequality. Unless radical things happen. One of the radical ideas is a universal basic income for all of humanity to account for the loss of opportunity, in other words a decoupling of income from jobs since there won’t be enough jobs to go around anyway. This would obviously be financed by those who control production and represents a kind of grand redistribution. A neo-socialism. It sort of makes sense – every human with enough income to live well, free to pursue whatever creative interest, while robots deal with the drudgery. Yeah… Given that socialism is a dirty word these days, I’m fairly confident it won’t pan out that way. But we do need such big thinking to get out of the mess that will almost certainly come. I’ve not provided any answers here. Because I don’t know. It wasn’t a mistake that the title is a question. Please, have a think as well. And let me know. A couple of days back I was reading Decoded, Jay Z’s autobiography and I got to this page below where he was talking about getting involved in Obama’s election – the first time round, those heady Yes! We Can! days. That was a very good summation of my old Facebook note Kini Big Deal? from Nov’ 08 just after watching the inauguration. Two terms are almost over now and you can argue whether Obama passed or failed. But the message that he stood for, stands for remains true. The initial results that came in gave McCain a shaky lead and for all the bravado and unfazed enthusiasm that I usually displayed anytime Obama and the election came up, I was still aware that things could go wrong at the last moment. So I did not sleep until there was a comfortable lead as reported by my text updates. But why should this election even be my problem, it’s not a Nigerian election; Visas are not going to become easier; Obama’s probably not going to declare a special “Save Africa” initiative; and even if he did we all know where the bulk of the money might end up. So why did I care? Why am I so ecstatic? During a discussion I once had with my friends, we discussed development, advancement and governance in Nigeria and Africa. Eventually we gravitated towards blacks in general. He gave excuses for the general backwardness of the black race; citing years of slavery, colonization, indoctrination, the whole shebang. I don’t like excuses, though I make them sometimes, so I was adamant we were responsible for our own destinies and that, had fortune reversed and we found ourselves superior, we probably would have done worse to the whites. The only thing I was not sure of is whether we’d have advanced as much as they have. He retorted, giving the example of a dog that had been restrained all its life. He postulated that even if the chains were removed, the dog would not venture beyond the limits that had been defined for it all its life. To my dear friend that was the problem with blacks, even though physically the shackles have been shed, the limitations remain in our minds. And that’s why this is such a big deal for me. Obama challenged the system, the prejudices, the limits. One of my friend’s status update on Facebook read “free, free, free at last!” this morning. Another update read, “If the terminator can be governor and Obama president, then nothing is impossible unless you say it is!” And my, did they capture it? That’s the big deal. It was early last year I first heard about Barack Hussein Obama. I was informed he was one of the democratic aspirants. And that he was black. And young. And kinda inexperienced. I was tempted to scoff, but I didn’t and just decided to wait and see. Then I heard him talk and I was like, “good God!” Then I read that book, “The Audacity of Hope” and watched the democratic debate with Hillary Clinton in The University of Texas at Austin. By that time I was officially an Obamaniac. Like he admitted in his victory speech this morning, he was not the most likely contestant for the seat. But he started with nothing more than the unmitigated effrontery to dare to think that the time had come for a black family to live in the white house. For a black man to take charge of the destiny of the United States. Talking about moving in, who wouldn’t want to? The approach to the airport takes you over the stunning Eden Island development. Just check out this picture below I took from the plane. 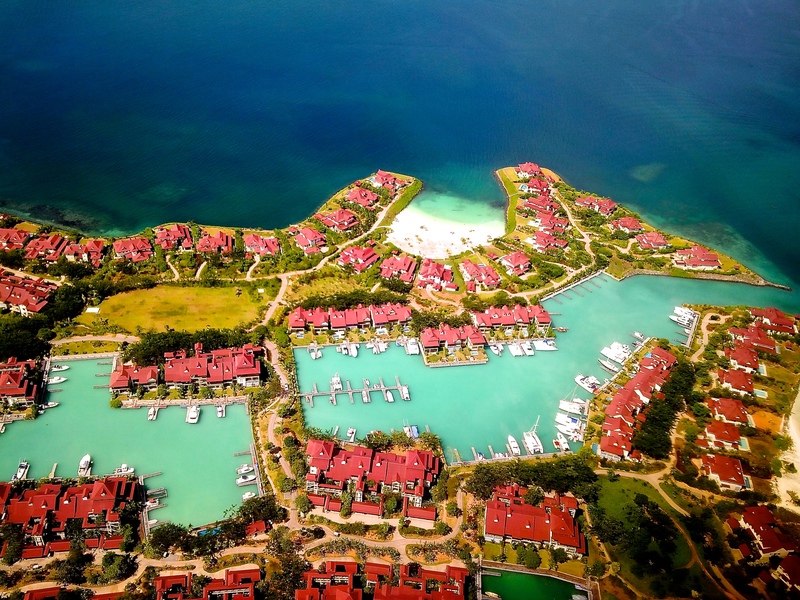 Aquamarine waters, red roofs, and docked catamarans? I was ready to move in right there and then! 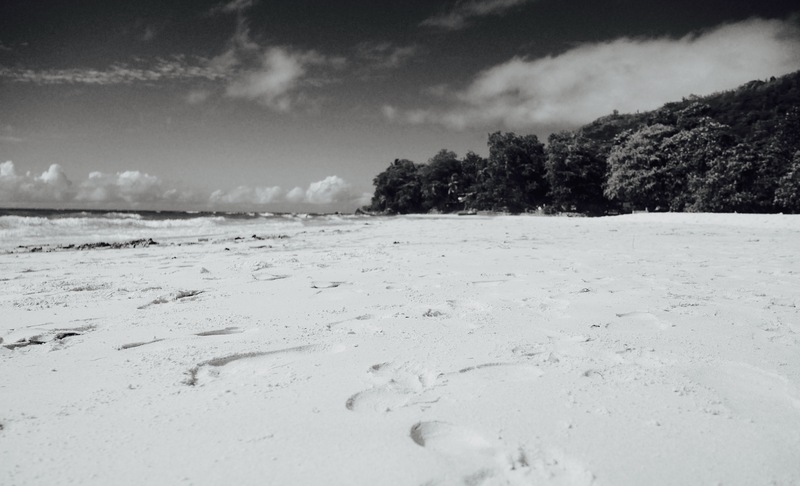 When you escape to an island you expect to see a lot of beaches, stunning glorious beaches. That’s a given. And Seychelles doesn’t disappoint. Noir – it’s stunning, even when you bleed off the colour.